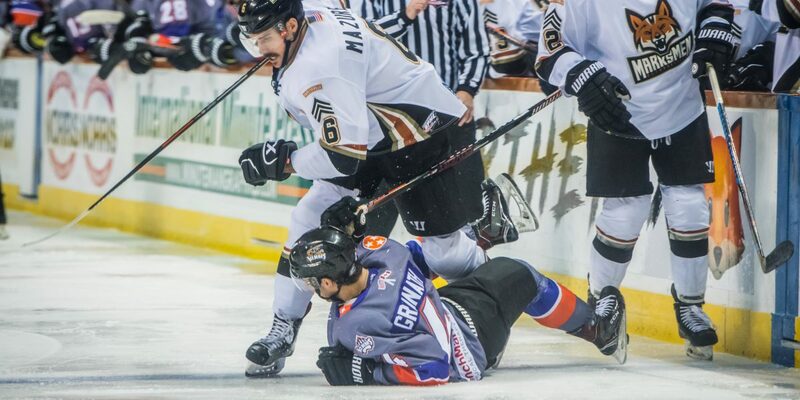 FAYETTEVILLE, N.C. – Road-tripping through the Smokies took the Marksmen to Knoxville, to open a weekend series with the Ice Bears. Following a rough 8-2 loss against these same Ice Bears on Saturday, Fayetteville went in to Knoxville looking for revenge. The Marksmen won the previous meeting in Knoxville last Friday 5-3 and looked to recreate that on Friday. The game started slow, as most do for the Marksmen. No goals were scored for the first nine minutes of the game until Knoxville found the net by way of Roberts Locans, a new-signing to the Ice Bears. The goal, his first, gave Knoxville a 1-0 lead early in the game. The rest of the period stayed quiet as both teams failed to score after the inaugural goal. The score remained 1-0 going back to the dressing rooms after one. The second period was a doozy, only a pair of penalties really headlining it. Both teams had their lowest period of shots in the second too. Fayetteville only took 10 shots, to Knoxville’s nine. Fayetteville got four penalty minutes in the second but Knoxville failed to convert on either powerplay. Neither team could convert with a man-advantage, as Knoxville went 0-4 and Fayetteville 0-2. Knoxville remained ahead 1-0. The final period of regulation was where the game sped up, Fayetteville only needed one goal to tie it back up and be in the game. Only 3:18 into the third period, the Marksmen finally found the net. David Mazurek, already letting his presence be felt after his ECHL call up, sent a perfect-pass over to Taylor McCloy to tip for Fayetteville’s first goal of the game. This was McCloy’s second in a week, and second for the Marksmen. With the game tied at one, everything opened up for Fayetteville and they were right back into it. Knoxville wasn’t about playing from behind or playing tied, and they showed it quickly. Only a few minutes after the equalizer from Fayetteville, Knoxville scored again. Bryce Nielsen sent one through to regain the lead for Knoxville. With only half of the third period remaining, Fayetteville had to move quick to get back on the board. Fayetteville knew they needed to score to have a chance at winning. With 5:32 remaining in the final period of regulation the Marksmen got just that. Off of a Jake Hauswirth faceoff win, Max Cook sent yet another goal between the pipes for the Marksmen, once again tying the game. With the game tied at two and just over five minutes remaining, overtime seemed to be a real possibility. Once again, Knoxville didn’t want to play from anything but a lead and they proved it once again. Only 1:22 after the Marksmen goal, Knoxville sent the ultimate winning goal into the net. Anthony McVeigh sent one past Dillon Kelley, giving the Ice Bears a 3-2 lead. Fayetteville sent multiple shots at the Knoxville net and even pulled the goalie in favor of an extra attacker but it didn’t matter. Fayetteville loses 3-2 to Knoxville on Friday. The loss puts the Marksmen at 18-14-4, sixth place in the league with two-straight losses. Fayetteville looks to get back into a tie for fifth on Saturday, closing out the season series against Knoxville. Join us at On-After Sports Bar & Grub tonight for the Home Away From Home watch party, or if you can’t make it out, listen LIVE to the Voice of the Marksmen Shawn Bednard on MarksmenRadio.com!